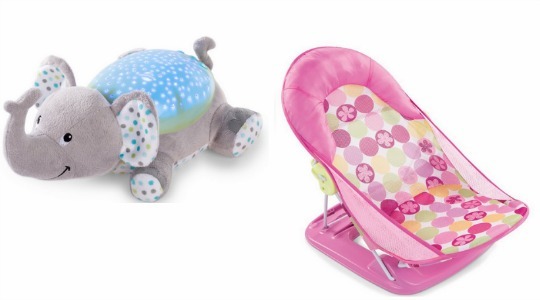 Summer Infant sell great toys for little babies and just now Amazon have them on as their Deal of the Day. This means that you can save £££'s on those must have Summer Infant items. There are only eight items included but don't let that put you off. Those ever popular Slumber Buddies are included and they sell like hot cakes in the rare event of them being under a tenner. Slumber Buddies are those soft toys that projects starry lights and play peaceful melodies at bedtime. They are ideal for those little nippers that are scared of the dark. Get them for just £9.99 each (today only). Available in: Eddie the Elephant*, Frankie the Frog*, Betty the Bee* and Bella the Butterfly*. The Summer Infant Deluxe Baby Bather* is only £9.99. I think I paid £15 for mine in a supermarket baby event. It was worth every penny in my eyes and was great when my son was a tiny baby. You can get FREE delivery if you have Amazon Prime or spend £20 plus. If you don't have Amazon Prime and you do not want to spend as much as £20, then delivery is £3.30.